I distinctly remember seeing Uwe Boll's "In the Name of the King" in a theater, with a free ticket and after the movie let out, and with the film's only other two audience members joking I should ask for a refund for wasting my time. Truth be told, the original "In the Name of the King" was one of those "so bad, it's good" films, featuring a bat crap crazy cast ranging from Jason Statham as the nameless lead to Burt Reynolds as medieval king and Ray Liotta as the film's sorcerer antagonist. Over the years the masochistic side of me has come crawling back to Boll's films, which have ranged from dreadful to incredibly promising. 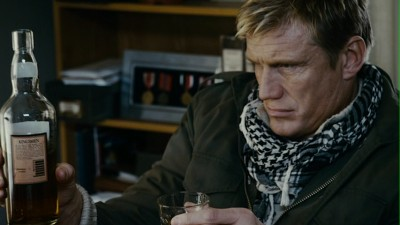 The prospect of a sequel to "In the Name of the King" featuring Dolph Lundgren as a modern day solider thrown through time/across dimensions sounded like another recipe for crazy, little did I know Dr. Boll chose this film to remind viewers just how awful a director he can aspire to be. "In the Name of the King: Two Worlds" did the impossible in my book: managing to be more insufferable and torturous than Miranda July's "The Future." Tasked with bringing a virtually non-existent story to fruition, Boll cobbles 90-odd minutes of crap and nothingness into a poorly paced trial of patience. My mind still can't wrap itself around the story's three-act structure which I still argue consists of an hour long first act, 10-minute second act, and 20-minute finale that borrows some pages from another D-grade SyFy Originals fantasy film. 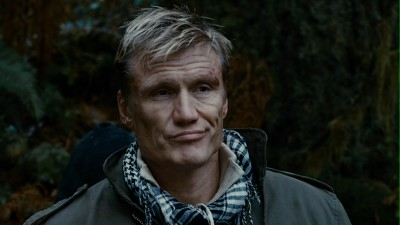 No stranger to Dolph Lundgren's infamous DTV career, "In the Name of the King 2" easily marks the generally enjoyable B-icon's worst work ever captured to date. There's a consistent formula to the film's madness; once the premise is established: Granger (Lundgren) a vet who teaches underprivileged youth's karate by brutalizing guys who used to be under his command his pulled through a portal into a medieval world. All this follows a poorly choreographed fight in Granger's house against medieval ninjas (the only bat crap crazy element of the original film that was carried over). Granger stumbles his way across a blandly designed medieval environment, fights more medieval ninjas and every so often is reminded by a character that he needs to defeat an evil foe to fulfill a prophecy. This chews up a good 50 minutes of screen time and while not always occurring in that order, is consistently bland and repetitive. Joining Granger is a Natassia Malthe whose other claim to fame is playing Rayne in Uwe Boll's "Bloodrayne: The Third Reich." Aside from Granger, the characters are impossible to keep track apart from their gender and frankly, it doesn't matter in the end. Boll does have a few tricks up his sleeve, mostly the film's visual style that does a great job of hiding the obvious low-budget origins. Likewise, Boll's shot design and approach to editing are more than competent, making the case that he goes out of his way to make a terrible movie slightly more credible. 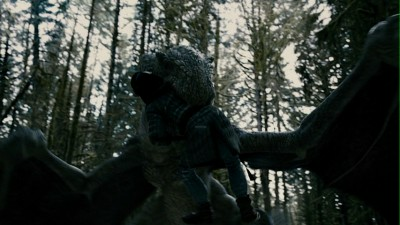 The last trick comes in the film's closing moments when the director decides to draw out the final confrontation between hero and villain for a haphazardly slapped together fight sequence with a CGI dragon. Eventually and mercifully the movie ends, with Lundgren smiling into the camera thinking of the check he just cashed. I'd like to think his final toast of victory is the actor breaking the fourth wall to toast the stupid but brave souls who didn't give up 10 minutes in, where anyone with common sense or good taste would have. The 1.78:1 anamorphic widescreen transfer is a consistently cool, grey film that sports some incredibly striking detail. Contrast is a bit more muddled and not as natural as looking as the rest of the film. The crisp nature of the transfer itself makes any wonky CGI pop-out like a sore thumb though and in-turn make the film uglier looking that it actually is. The Dolby Digital English 5.1 audio track is consistent, but lacking in overall depth and clarity. Dialogue is undermixed at times and given Lundgren's proclivities to muttering his lines, some of the riveting plot developments may be lost on less than keen ears. The battle sequences could use definitely use a bit of a kick, but are more consistently mixed from a sound design standpoint. English SDH and Spanish subtitles are included. No Uwe Boll DVD would be complete without bonus features to waste more of my time. A pair of promotional featurettes "Behind the Scenes of In The Name of the King: Two Worlds" and "From Page to Screen: Writing In The Name of the King: Two Worlds" are joined by a pair of commentary tracks. Yes, two full length commentary tracks are on board, one from director Boll, the other from writer Michael Nachoff. Imagine a teenage boy wrote a short story about soldiers, swords and sorcery, and ninjas. Now imagine that story padded out a good 350%, starring Dolph Lundgren, directed by Uwe Boll and called "In the Name of the King: Two Worlds." Oh how I long for the days of Ray Liotta, evil wizard. Skip It.